Why has democracy failed to reduce corruption in Kenya? Framing the challenge in game theoretical terms, Dominic Burbidge examines how mutual expectations between citizens dictate the success or failure of political reforms. Since 1992, Kenya has conducted multiparty elections with the hope of promoting accountability and transparency in government. This is being undermined by ongoing corruption and an increasingly centralised state response to terrorism. 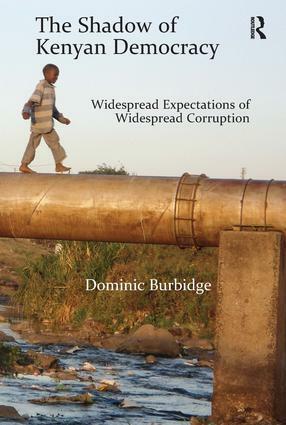 Providing a nuanced assessment of democracy’s difficult road in Kenya, Burbidge discusses the independent role being played by widespread social expectations of corruption. Through tracking average views of the average person, it is possible to identify a threshold beyond which society suffers mutually reinforcing negative social expectations. This trend is the shadow of Kenyan democracy, and must be treated as a policy challenge on its own terms before institutional reforms will be successful. Dominic Burbidge is a Post-Doctoral Research Associate of the James Madison Program at Princeton University. He has taught law and public policy at Strathmore University in Kenya, and completed his doctorate at Oriel College, University of Oxford.